Is social getting silly yet? I tend to think it got silly a while ago. Instagram went for $1 Billion. Waze (has anybody heard of Waze?) will shortly go for a similar amount, to Google. Facebook has acquired 35 companies since 2007, mostly for undisclosed fees. And Twitter could be worth $11 Billion if it floats. Doctor Evil shouldn't have phoned the UN to demand daft sums of money, he should have threatened Facebook's bank manager. So what's the problem? If big companies want to spend Billions acquiring smaller companies, which have lots of users but no revenue, then that's their business. It's our business too. Here's the problem. Yes, that's a cliché. It's a cliché because it's true. Somebody has to pay for Facebook and Instagram and Twitter and all the other social toys. Facebook's data centre is so big, it's having problems with the air conditioning forming rain clouds and drenching the servers. Yes, really. You can't fight the weather, so instead, they've waterproofed the servers. We can be fairly sure that data centres big enough to fit rain clouds in are very, very expensive. Advertisers are paying for all of this, which indirectly means that you and I are paying for all of this, with our attention and our changes in purchasing behaviour. That creates two problems and I've talked about one of them before. The pot of advertising money isn't getting bigger, which means there's a limit on how many businesses can be supported solely by advertising and how good their products can get from a user's point of view, before the money runs out. Today's it's a slightly different issue. Today's issue is that social networks aren't built to be the best social networks that they can be for you. They're built to be the best that they can be for advertisers. That is the essence of the title of this post: We get the social networks we deserve. We want free stuff, so we get the minimum quality product that will hold our attention, so that we can be advertised at. Being the best for advertisers means lots of eyeballs at minimum cost. A news feed is 'better' if it can fit more ads in it, without driving too many users away, not because it communicates news more effectively. Mobile is 'worse' unless you can figure out a way to fit some adverts alongside the content on a smaller screen. You ask for free? Then you deserve second best. Imagine for a minute that you couldn't put any advertising at all on a social network. Either it's impossible, or it's illegal, or nobody believes it works, so no businesses are willing to buy the ads... Whatever reason you like. Time for a thought experiment: What might social networks look like if their users were the customers? The first difference is obvious - you'd have to pay for them directly somehow. So now we're looking at Facebook for $5 a month? Actually no, I don't think so, and this is where it gets interesting. Centralising everybody's social data onto a data centre so big that it has its own micro-climate is stupid. The only reason for doing it, is that Facebook needs everybody's information in one place so that they can data mine it for targeted advertising (well that, and to make things easier for the NSA). If we're not advertising, we don't need to centralise the data, so what happens now? What I think happens now is that you can have a distributed social network, built along the lines of the internet itself. In essence, what Facebook does with your profile, is the social equivalent of there only being one website hosting service in the world and all of those websites having to use the same template. 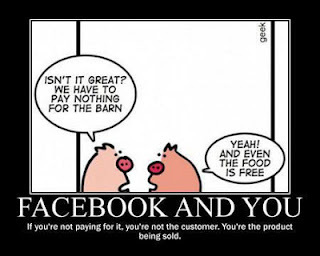 Without advertising, you wouldn't have everybody paying Facebook to host their data. You'd host your own profile on any server that was always-on, in the same way as you can host a website for a few pounds a month. You could customise that profile however you like, since in the end it's just your personal website, but with a central news feed that announces new content. There's already a good way for websites to do this, through RSS. It's easy to imagine a lively open source community of personal profile templates that would make design easy and I'm sure we'd all rather not go back to the technicolour car-crash that was the original Myspace. If you like, imagine your social profile as an app that you can install on any sever, for a few pounds a month. It can host photos, videos, blogs, plugins that let you tweet... a whole host of exciting things. Ten years ago this would have been difficult and techy, but there's no reason it should be now. The internet was actually headed this way, with lots of people having their own personal websites (slightly geeky people, because it used to be slightly tricky) before Myspace and then its more modern brethren came along. You used to get some free web hosting space with your internet connection and without Facebook or Twitter, that model would quickly re-emerge, so that hosting your profile(s) wouldn't even cost you money directly. The final piece of the puzzle for an effective social network without a Mark Zuckerberg to own it, is another - probably open source - piece of software; an aggregator for all of your friends' news feeds, that becomes your "Facebook". That's very easy, as each friend's website is announcing new content and you just have to pick it up as it gets announced. If you use any kind of news reader then you already know how simple this is. The clue's in the name; Really Simple Syndication. You'd need a way to set some, or all, items private but that's not hugely difficult either and can be handled by the (open source) software that's driving your profile. There are sites all over the web with private and public areas and yours would have those too. You own your data. Nobody (I'm especially looking at you Facebook) is incentivised to undermine the privacy of your data in order to sell adverts. And even if they were, they don't have it. Social tools are built to appeal to you, enough to actually pay for them. They will be better than the ones you have now. Nobody gets to pay to 'promote' content in your news feed that you didn't ask to see. Your social profile can be whatever you want it to be, rather than a homogenised blue and white. You're a photographer? Make it visual. Writer? Add a blog. Musician? Host music. Love Hello Kitty? *Unfollow*. Some profiles would undoubtedly be garish, but modern templates would help. We've come a long way since Geocities. You can divide up your social world however you want and have multiple personalities - work, leisure, hobbies, whatever you want, as separate sites, or just separate news feeds within one site. Nobody's trying to get the whole you in one place so that they can sell you stuff. Google+ tried to do this with circles but they screwed it up. With your own site (or sites) you can have multiple news feeds and please do create a separate baby news one, so that the rest of us can choose not to follow it. I'm sure there are more... The really big one is that all the tools are being designed exclusively for you. Currently, social tools are designed 'for you' in the same way that fishing bait is designed 'for fish'. And we're back to the original point. A modicum of effort and a couple of pounds a month, would see a social networking revolution. But we like free and so we get the social networks we deserve.